Well Grandma Melrose arrived this week so I've had 2 very excited children. They were up at 6.15am on Marion's first morning. Marion, of course, was having a well deserved lay in! I managed to keep them at bay until 7.15 and then they could contain themselves no longer. Jacob has been attached to her ever since, even by passing Mummy and Daddy when it comes to picking him up from school to run to Grandma instead. Have shown Marion the sites although there's still lots to do. Had a nice wander around Lowry (the area where Jacob and Abi's school is) popping into lots of boutiques that you can't do when you have children in toe. Visited the Denver mint which was very interesting. Do you know that paper money only lasts 22 months in circulation? Abi wasn't that fussed and kept laying on the floor entertaining everyone but Jacob was a very good boy, of course holding Grandma's hand the whole time. 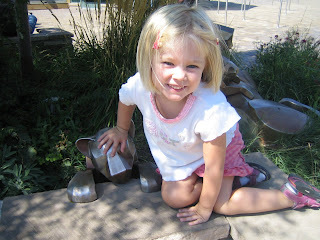 Abi and I visited the zoo with friends we met through Carrie - Melissa with Aiden and Kirk with Cody. We had a lovely time and ended up joining as I think Abi and I will spend the odd afternoon there together. Yesterday it was 'Golden Years of Lowry'. A weekend celebrating the area with stalls and activities. The local air and space museum was free so we had a good old wander around. 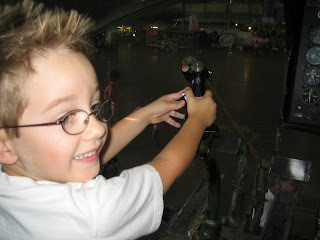 Jacob and Abi loved the museum, you could sit in lots of the planes. There was a "train" that took you to the museum. It was very noisy and bumpy and both Marion and I came off with headaches! Luckily the museum was a big hit. Went to a Brit BBQ last night, good to catch up with some teacher talk and hear some accents from home. Off on a picnic in Golden today so will post some photos from that later. 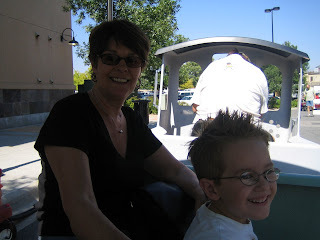 Photos here are of Grandma and Jacob on the train - notice Jacob's new hair cut. 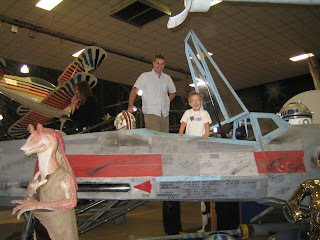 Jacob in a helicopter, Allen and Jacob in a Star Wars fighter plane and Abi at the zoo. Spoke to Mum and Dad this morning and heard good news - Grandma and Grandad Holwell may be up for a visit in the Spring, I'm very excited at this news although I won't me telling Jacob and Abi just yet as they have no concept of time and they would be asking me everyday until they actually arrive! wow. i hope your parents can visit. that would be great! owen is off to his first day of preschool this morning. better go shower . . .
Will phone you in the week to see how it's going, any sign of Jack? Well rach i never fail to be amazed by your ability to write so much about what you've been up to... and here you are doing it again! The sound of snow sounds great, i went with Jeremy - do you know about Jeremy?!!? :) - to Tignes in France with his friends in late Aug and we got 2 days of fantastic skiing in as there'd been a huge dump on the glacier. The rest of the time was spent rafting, walking, cycling and eating and drinking extremely well! I am now trying to behave myself after having endulged so much! Grandma Melrose's 3rd and final week!